Thank you for this summary Steve. But disappointing that you are still in the mindset of competition, even in the review above. Rather than seeing what both have to offer you pit one against the other. There is no doubt that capitalism has brought us many advantages, at the expense of those it has exploited. The competition which you extol as giving business ts creative energy, runs right through the whole economic structure. While there are some winners, there are many losers. Serving the shareholders will in many cases take priority over serving the public at large. Competition in business is still based on growth, which is destroying the planet. Laloux book introduces a new possibility of collaboration which may help to turn things around. I’ve heard Laloux speak and his research and resultant book on “emergent” organisational structures is captivating, especially the Dutch nursing example. 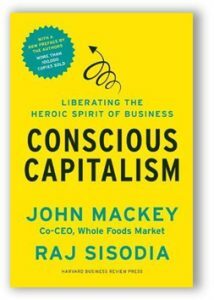 It’s unfortunate that he’s utilised spiral dynamics and Ken Wilbur’s forward to frame his book as it takes away from the significance of what is happening in business as dominator hierarchical structures are showing their true inflexibility and archaic inability to encompass the social and integrative nuances required now in our world. I disagree that competition is needed as a driver. Perhaps that is an American view. Darwinian in nature and divorced from its past and shadows, business can be untethered, optimistic and innovative and also wholly blind to its effects on the bigger whole. America and it’s reliance on capitalism and competition and growth now more than ever needs to slow down, to reflect and allow a larger social and unknown humble component into its perspective before it spirals into its own silos of destructive chaos. I think Steve misses the value of the Dutch example. As one who is immersed in coordinating care for a mother with dementia I am shocked by how wholly unprepared, disjointed and relatively uncaring our social and health system is here in the UK. Even worse in the USA where home health care for the aged and sickly is for the priveledged only. The Dutch model actually confronts our current social and economic models, as well as our philosophical views. It shows there is a humane way to reintroduce values of care concern and perhaps love to society, moving forward without the dark trappings of competition bottom lines end efficiency measures. “Competition” increases particular kinds of performance. It is popular in sport (though even it largely relies on co-operation) and business (also mostly reliant on co-operation) where the measures are one dimensional (faster, higher, more money). For complex tasks competition usually gets in the ways and leads to tunnel vision. The focus goes to the competing rather than pursuing the goal. In business the famous example of this is the two people who need to run away from the bear — one stoops down to put on a pair of running shoes. The other says that this won’t make the bear less angry or hungry. The guy who stooped down points out that he only has to outrun the other guy. 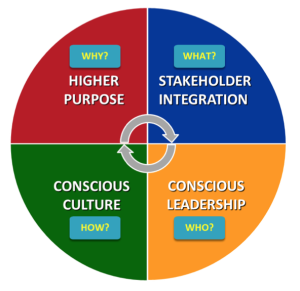 Not surprising that the Dutch example provided by Laloux would be more of a nonprofit model in a smaller, more homogeneous, and socialized business climate where it would make perfect sense to consider a pseudo Teal post modern approach. Totally agree that this theory presents some nice progressions in a postmodern direction but does not fully integrate the best of modern and even some elements of premodern organizational structures, tactics, and strategies that are not only essential for optimizing business organizational efficiencies in different cultures and settings , but absolutely necessary in order to compete against and with the modern business organizations that dominate much of the current landscape for the for seeable future. Thanks, Steve. I remember having a discussion about Laloux’ work with you last year. Two thoughts: First, I agree that what Laloux has labeled “teal” sounds to me more like “green” as I understood it from numerous workshops with Don Beck. 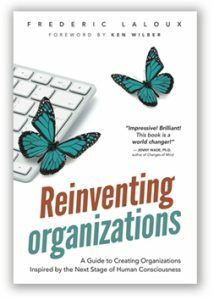 I have done follow up interviews with two of the companies in Laloux’ book myself as I’ve been writing my own book on strategic agility, and happened to know key leaders in each. To me, a truly teal adaptation is a response to a complex market environment that demands an approach to strategy formulation that must integrate both a clear declaration of intent from the leadership with a more collective expression from everyone as to how to carry that out, all with lots of feedback built in. Far from being an adaptation to a complex market, both companies I interviewed (I won’t name them here) are actually in fairly stable environments in which big strategic decisions are made infrequently, and generally by the senior leader. Second, I think that Wilber’s prismatic color scheme lost something in translation from Spiral Dynamics with its more dialectic framing. If one were to view teal as an antidote to the failings of green, rather than a simple progression, there wouldn’t be this confusion between what each level is about.